Nashville, TN – Superstar Brad Paisley announces March 3 as the release date of his forthcoming album, LOVE AND WAR. “Today” is the first single from the much anticipated album and is already in the Top 15 of the country singles charts. Life Amplified World Tour: Live at WVU is the new live concert DVD and CD from multi-platinum country superstar, Brad Paisley, which will be released Friday, December 23. Paisley returned to his roots by going home to West Virginia for a special outdoor concert at West Virginia University. Straight off the wildly successful "Life Amplified World Tour," the show was shot with 20 cameras in front of a hometown crowd of over 15,000 people. Paisley played an electrifying 2 hour show that included many of his 23 number one singles, such as “Mud on the Tires,” “Then,” and a surprise rendition of “I’m Still A Guy,” featuring Chris Young. The show also includes a very special version of the John Denver song “Take Me Home, Country Roads,” which has become an anthem for WVU. NASHVILLE, Tenn. (December 12, 2016) Country music superstar Brad Paisley has announced the continuation of his highly successful Life Amplified World Tour with dates added in February 2017. The tour will be making stops in eastern Canada and northeast U.S. Special guests will be hit-maker Chase Bryant and rising-star Lindsay Ell. Brad Paisley is a critically acclaimed singer, songwriter, guitarist and entertainer whose talents have earned him numerous awards, including three GRAMMYs, two American Music Awards, 14 Academy of Country Music Awards and 14 Country Music Association Awards (including Entertainer of the Year), among many others. He has been a proud member of the Grand Ole Opry since 2001. Paisley has written 20 of his 23 #1 hits including “He Didn’t Have to Be,” “Mud on the Tires,” “She’s Everything,” “Water” and “Remind Me,” among others. His highly successful Life Amplified World Tour 2016 traveled across the US and Canada. 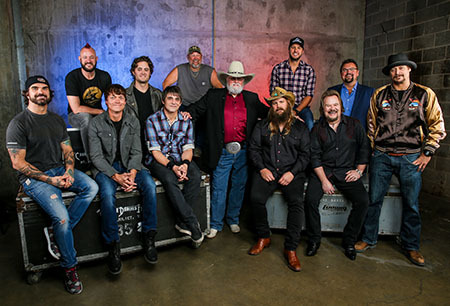 Paisley also took his “Country Nation College Tour presented by Frontier Communications” to 9 IMG College partners the Fall of 2016 for free concerts on the campuses, a follow-up to his initial 2015 college tour. His current single, “Today,” is resonating with people around the globe and the music video has been viewed over 30 million times. Paisley has partnered with Boot Barn® and developed an exclusive line of jeans, hats, T-shirts, jewelry, belts and woven shirts called Moonshine Spirit by Brad Paisley. Connect with Brad at www.BradPaisley.com, www.Facebook.com/BradPaisley, on Twitter @BradPaisley, on Instagram @Brad Paisley, and YouTube at YouTube.com/BradPaisley. Nashville, TN – Columbia Nashville singer/songwriter and FOUR-time GRAMMY nominee Maren Morris is set to make her first appearance on NBC’s Saturday Night Live as the musical guest tonight, 11: 30pm ET/10:30pm CT on NBC. NASHVILLE – 2016 CMA Pinnacle Award winner Kenny Chesney and CMA are combining resources to aid families devastated by recent wildfires in Gatlinburg, Tenn. The wildfires were responsible for 14 deaths and more than 2,400 homes and business that were damaged or destroyed. A native of East Tennessee, Chesney has been a vocal and ardent supporter of the ongoing relief effort. NASHVILLE, TN (December 9, 2016) – The announcement of Dolly Parton’s upcoming “Smokey Mountains Rise: A Benefit for the My People Fund” telethon airing Tuesday, December 13 at 8:00pm EST on Great American Country (GAC) inspired the Academy of Country Music, ACM Lifting Lives and Taylor Swift today to pledge, in advance, a combined $200,000 to ensure the telethon starts off with a bang. NASHVILLE, TN - Dec. 8, 2016 - While Multi-PLATINUM artist Thomas Rhett garnered his first-ever GRAMMY nomination this week for Best Country Song with his record-breaking “Die A Happy Man,” he closes out an unparalleled year topping year-end radio, digital sales and streaming charts after earning continued commercial success and critical acclaim for his sophomore release TANGLED UP (The Valory Music Co.). With more than a dozen major award show nominations and trophies from the Country Music Association, Academy of Country Music, Billboard Music Awards, Broadcast Music Inc. and CMT Music Awards, his current single “Star Of The Show” off TANGLED UP DELUXE shoots up the Country radio charts as his fastest rising single to date. Thomas Rhett prepares to officially step into headliner status in 2017 on his HOME TEAM TOUR and at some of Country music’s biggest festivals alongside superstars including Jason Aldean, Luke Bryan, Kenny Chesney and Miranda Lambert. Following a serious fall that resulted in two broken ribs and a punctured and partially collapsed lung this past Friday evening during a show at the Starland Ballroom in Sayreville, New Jersey, Granger Smith took to social media today to reach out to his fans with an update. Nashville, TN (December 3, 2016) - Granger Smith was injured last night while performing a show at the Starland Ballroom in Sayreville, New Jersey. Granger was standing on a monitor when it gave way, bringing Granger crashing off the stage into a metal barricade. Miraculously, Granger managed to get up and finish the set through excruciating pain, which ended with the crowd singing "Backroad Song." Nashville, TN – Columbia Nashville singer/songwriter Maren Morris as previously announced has teamed up with GRAMMY Award-winning singer/songwriter and producer Alicia Keys for the next installment of CMT Cross Roads, airing Friday, December 2nd at 10pm ET/PT. PIGEON FORGE, Tenn. (November 30, 2016) – In a video message released this evening, Dolly Parton announced a new effort by The Dollywood Company and The Dollywood Foundation to establish a fund to assist the victims of the Great Smoky Mountain wildfires in Tennessee. The new My People Fund will provide $1000 each month to Sevier County families who lost their homes.